Creedence Clearwater Revisited may be available for your next special event! After getting their name back, this Creedence Clearwater Revisited is hotter than ever! Includes two original members and minus John Fogerty. Stu Cook and Doug "Cosmo" Clifford may not have intended it, but their band Creedence Clearwater Revisited has taken on a startling life of its own. The Rock and Roll Hall of Fame rhythm section (bass and drums respectively) from the legendary Creedence Clearwater Revival launched the Revisited project in 1995 to play live Creedence Clearwater Revival hits. "We never really had any intention of playing in the public," says Cook, "but a friend wanted to promote a couple of concerts. We got talked into it, but didn't know how it would go over." The reaction to those shows was astoundingly positive, Cook observed, driven in part by a generation of kids "who weren't even born when the music came out." 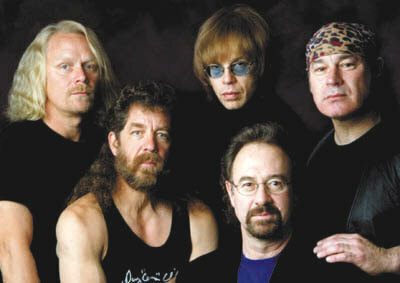 Having now performed all over North America, Europe and Asia, knocking out crowds who witness the experience of Creedence Clearwater Revival members performing the songs that are still repeatedly played on the radio and are a staple in films, Creedence Clearwater Revisited has come a long way. Creedence Clearwater Revisited is the latest chapter of in the now four-decade long journey that began in the 60's when Creedence Clearwater Revival's distinctive rock sound captured the world's imagination. Classics like "Suzie Q," "Born on the Bayou," "Run Through The Jungle," "Bad Moon Rising," "Fortunate Son" and "Who'll Stop the Rain" have earned the band a following that has stayed faithful over the years and continues to grow today. Following Creedence Clearwater Revival's breakup in 1972, Stu joined some former Doobie Brothers in the pioneering country-rock band, Southern Pacific, while Cosmo performed with the renowned Sir Douglas Quintet. In 1995, after realizing they both missed playing Creedence music live, Stu and Cosmo launched the Revisited project not knowing what the reaction would be. The public's embrace of Creedence Clearwater Revisited turned out to be overwhelming and the group has since played some 100-plus shows a year around the globe. In Creedence Clearwater Revisited, Stu and Cosmo have brought together a group of musicians who passionately and faithfully deliver live the sound and spirit of the music and what it was about. Lead guitarist Elliot Easton originally found fame playing with the 80's hit machine, The Cars, and his blues rock guitar and soaring solos are a perfect fit in Creedence Clearwater Revisited. Lead vocals are handled by John Tristao, whose career started with the late 60's band People and its top-ten hit "I Love You." John's powerful tenor and endless energy leave audiences astounded. Multi-instrumentalist Steve Gunner (keyboards, guitar, percussion, harmonica, high harmonies) rounds out the band's timeless sound. Cosmo, Stu, Elliot, John, Steve and Creedence Clearwater Revisited remain true to the musical legacy that has inspired a generation and stood the test of time. "We thought if we could find the musicians that could capture the sound and recreate what the music was about, we'd do it," recalls Cook. "If we couldn't, we wouldn't." "I couldn't imagine [the band] coming together and staying together better than this organization," offers Cook, who likens Revisited's intra-band rapport to that of early Creedence Clearwater Revival, when the band was slugging it out in Central California as the Golliwogs. Creedence Clearwater Revival's distinctive rock captured the imagination of the pop world – the songs made great three minute radio gems – and the more politicized subculture, and they successfully bridged the gap between the underground and mainstream audiences. Writer Greil Marcus wrote that "rarely in rock and roll history has there been so close a relation between creative achievement and audience response." "People don't want to be involved in an endless debate," Clifford sums up about the Creedence Clearwater Revival break-up. "They want to hear music. Creedence Clearwater Revisited is an experience they're not going to get anywhere else." booking entertainment, such as major name entertainers or celebrities, booking Creedence Clearwater Revisited, booking information on Creedence Clearwater Revisited, or hiring Creedence Clearwater Revisited for your special event, or to book or hire Creedence Clearwater Revisited, or if you are seeking the Creedence Clearwater Revisited booking agent for corporate entertainment or for a private party. Consider the opportunity to book Creedence Clearwater Revisited or other entertainers for a wedding, birthday, anniversary, business meeting or convention. If you are not a talent buyer, we are unable to provide Creedence Clearwater Revisited manager or management contact information. Consider this your official Creedence Clearwater Revisited booking agency web site – The booking agent who works for you! This company acts as an entertainment consultant or broker/producer and does not claim or represent itself as the exclusive agent, representative or management of Creedence Clearwater Revisited. Creedence Clearwater Revisited, rock & roll music artists - booking agent. This group may be available for your event. Book them if you can. You will have the time of your life!